The Lyman Electronic Trigger Pull Gauge allows for accuracy to 1/10 ounce over a working range of 0 to 12 pounds. The Digital Trigger Pull Gauge is equipped with a large, easy to read LCD display and is push button operated for zero, clear and averaging functions. It can also can be converted to read in kilograms. Unlike other gauges, there are no weights or sliding pointers to worry about. Simply place the gauge on the trigger and pull! 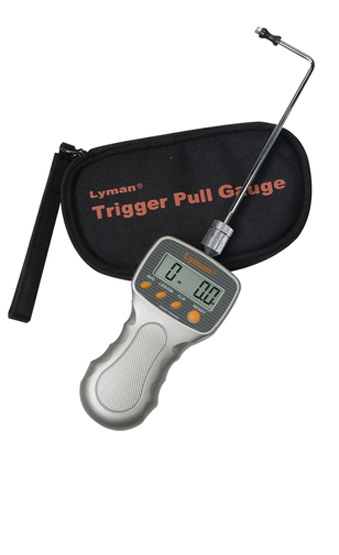 Lyman's Digital Trigger Pull Gauge accurately records the results. You can also take multiple readings and the Digital Trigger Pull Gauge will tell you the average weight for the string. This is the perfect tool for target shooters, silhouette shooters, gunsmiths, hunters or anyone who wants to adjust their trigger pull weights accurately and easily.